And too much white space everywhere, upper side, between script, etc. Will be out in couple of days. @nithin thank you sooo much… been waiting for it from long time. How can we add Nifty 50 or Nifty 200 stocks at once in Kite Web? I mean in a single click. Please add this feature. Much needed. @nithin. This will save lots of time. Upstox offers this, and you should too. This is in our next list of things to provide. How to Set the Dark Mode in Android App? Hi @siva and @nithin, Thank you for the update. I love the interface. 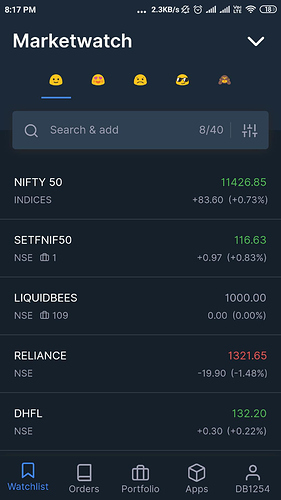 Trading view has replay button in premium version, is it possible to implement the same in Kite ? I can see the team making more effort for the customer satisfaction. However, Zerodha loosing its name due to tech glitch especially during high volatility time period. I wish this perspective should change and happy to travel in your growth. Once again, Zerodha team doing great work. Kudos. Ya, already checking on this. Will check this with team. @siva There is problem in saving charts or chart layout ! Its not working like ChartIQ. So think there is something wrong as compare to chartIQ. Please check it. In running market, renko, line break get hang… even in mobile and desktop too. Would be great if I could open charts of scripts which are not in my watchlist. It has to be on your market watch for charts to open. Means? can you explain a bit more? Any tentative date or how much more time it will take for “Dark Mode” update release? May be 3 to 4 days more.